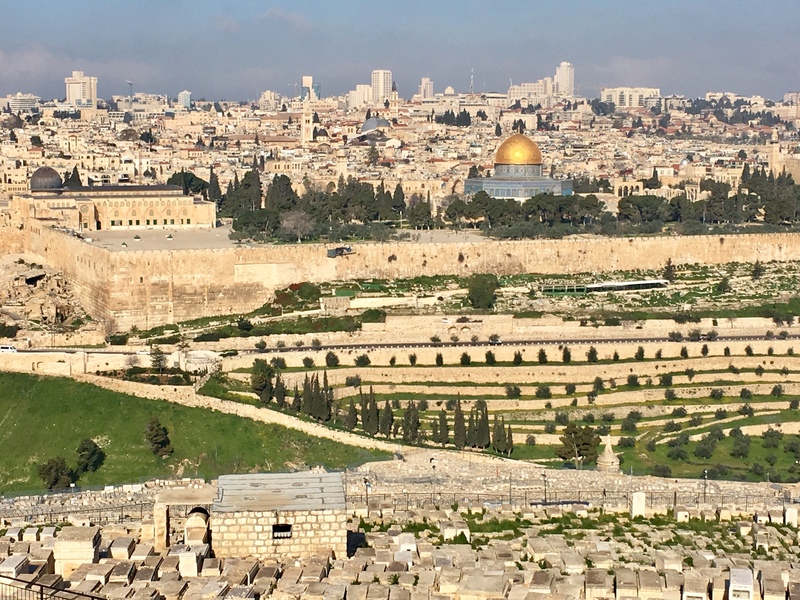 No Christian can stand on the Mount of Olives and gaze at Jerusalem without deep and conflicting emotions. There is joy, for this is the city where God “chose to put His name.” There is sadness, for the Gospel is not welcomed in this city. There is anticipation, for someday Jesus will return to this very mountain and Jerusalem will be exalted and the worship of the true God will again take place. The 1,400-year-old Muslim “Dome of the Rock” (the building with the golden dome) that dominates the ancient temple area stands as a reminder that for now, Jerusalem is a divided and contested city. It is, in some sense, the home of the three great religions: Judaism, Christianity, and in a secondary sense, Islam. Here Jesus is sometimes honored, but seldom—if ever—worshipped. There can be no permanent peace here until Jesus returns. Muslims believe that they have a right to the city because the promises God made to Abraham are to be fulfilled to his oldest son Ishmael, and not Isaac. Also, the Koran says hateful things about the Jews; and as a result, the goal of “pushing Israel into the sea” is still alive and well among those who are truly faithful followers of their religion. Terrorism is always a threat. On the other hand, the Jews believe that they have the most compelling right to this city, given the promises to Abraham and the fact that for centuries they existed here as an independent state (Islam has occupied the land for a number of centuries, but never as an independent state). Obviously, peace here can only be temporary, never permanent. But the good news is this: Jesus will return to the Mount of Olives and Jerusalem will become the epicenter of the worship of Jehovah. At last, we will see these words fulfilled, “…and many people will come and say, ‘Come, let us go up to the mountain of the Lord, to house of the God of Jacob…for out of Zion shall go the law, and the word of the Lord from Jerusalem’” (Read Isaiah chapter 2).